Stephanie Braeuner has been dancing for nearly 17 years and teaching for 13. First learning styles like ballet and jazz, she began ballroom dancing shortly after graduating high school. Ever since then, she’s been in love. She has competed in numerous competitions in the southeast region as well as performing in local shows. Some of her favorite events are fundraisers because it’s a chance to give back in her own way. When asked what her favorite dance is, the reply will always be, “It depends what song is on”. Stephanie has always had a desire to teach young people, from elementary school to college age students. 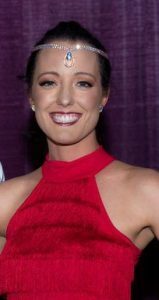 In addition to being an instructor with Dance Tonight and Director of our youth dance program, she is currently one of the coaches of the Ballroom Club at the University of Tennessee in Knoxville. Stephanie believes for all students, adults and children alike, dance lessons teach life lessons. Stephanie’s goal with every student is to not only have a great time, but to help them become their best selves through dance, like dance has done for her.